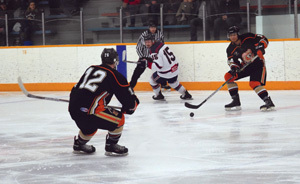 The Coaldale Copperheads won the HJHL South Division final Wednesday night in Coaldale. Going into Wednesdays game, the Copperheads were leading the best of 7 South Division series 3-1 vs the Okotoks Bisons. Coaldale came out strong and were leading the Bisons 2-0 after the first period with goals from Tyler Anderson and Brandyn Howg. Brandon Langridge from Coaldale scored at 6:49 into the second period, making it 3- 0 . Okotoks rallied back to come within 1 goal with a 3-2 score when Mitchell Konschuk scored for the Snakes to go up 4-2 before the close of the period. It was all Okotoks in the third as they clawed back, tying the game at the midway mark of the third. Despite numerous opportunities at both ends the game was dead locked 4-4 in regulation time. Just 5:33 into the overtime, Gavin Burns made an outlet pass out of his own end to set up a 2 on 1 with Jayden Bexte sliding the puck over to Jayden Smith who sealed the victory goal to end the game and the series. The overtime win gave the Copperheads the South Division title and a berth to provincials. This also marks the fourth year in a row the Copperheads have knocked out the Okotoks Bisons in playoff action. Copperheads claimed the south title three years ago, the only other time in eleven years therefore, not an easy task to do. What a highlight to receive this victory on home ice in front of many dedicated home fans. The Coaldale crew will go on to play the Red Deer Vipers in the Heritage League final — a best of three affair. The Vipers also earned a berth to the final and a provincial berth by beating the Airdrie Thunder four games to two in the North Division final. The best of three will take place this coming week with exact times not finalized at the time of the Sunny South News’ press deadline. Fans are encouraged to tune into their other media feeds for updates on exact times. There is a very good chance Saturday, March 24 will be game two at the Snake Pit. The game will mark the lone home game of the series, as well as the last game of the year for the Copperheads at the Snake Pit. Copperheads note they have secured a earlier than normal puck drop of 7:30 pm for the Saturday night affair with dreams to cinch the league title. Game three (if needed) will take place Sunday back in Red Deer they are assuming but please follow their feed notices as could be changes. In an effort to raise funds for the Copperheads Provincial run to Fort St. John, BC ( Mar 28- April 1), the team is graciously accepting any contributions to help with their journey. One event they will be hosting is an organized bottle depot at the Coaldale Sportsplex on Saturday. The team will have a cargo trailer station for any of the willing from 12 noon till 7:00 p.m. for bottle donations. The Provincial effort is expected to exceed $20,000, due to transportation, food and accommodations due partly due to the distance the Snakes need to travel.